I think most readers of 10,000 Birds will, at this point, remember my great disappointment in January of 2012 when I went on the Black Rail field trip at the Space Coast Birding and Wildlife Festival and neither heard nor saw a Black Rail. Now, in the grand scheme of things, me not being able to check Black Rail off of a checklist is really not important at all but, nonetheless, I was pretty bummed out about it. Like MacArthur did when leaving the Philippines to the Japanese during World War II, I vowed to return. It took MacArthur more than two-and-a-half years to return to the Philippines triumphantly so I guess you could say I outdid him by returning to St. John’s National Wildlife Refuge just under two years from when I left it, a defeated birder. You know, that is, if you consider a birder going back to a wildlife refuge on par with a general leading soldiers into battle. Which is just ridiculous, of course, because birders are clearly more heroic. Anyway, I was back on the Black Rail field trip, co-leading it once again with Mike Legare of the U.S. 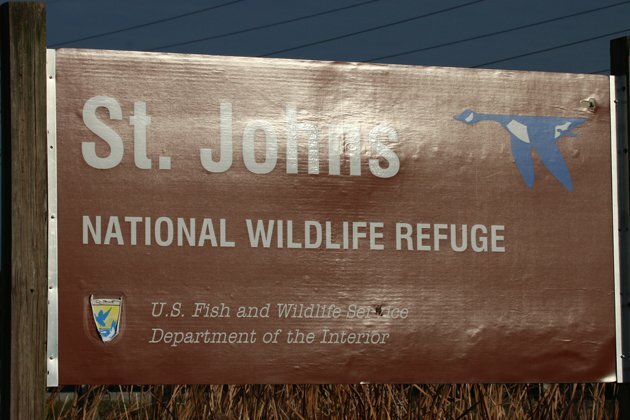 Fish and Wildlife Service, who knows more about Black Rails at St. John’s than I do about any birds, anywhere. We piled onto the back of the pickup truck and the trailer the truck towed and headed out to the refuge with robins calling as they flew overhead and Yellow-rumped Warblers chipping from the scrub on both sides of the dirt road. Before long we were walking out into the marsh. Prime Black Rail habitat. You know, if Black Rails actually exist. 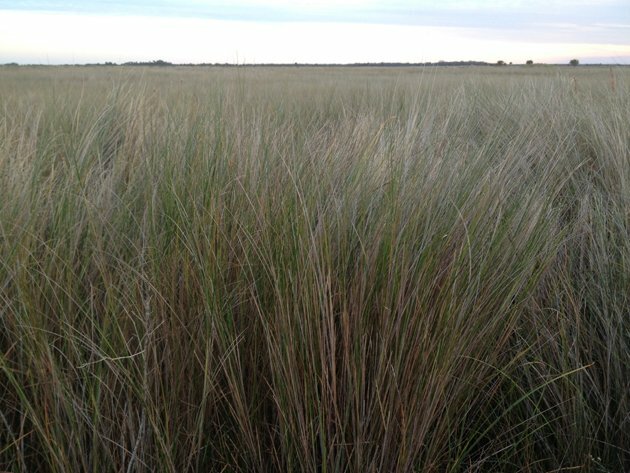 This is what Black Rail habitat looks like. Exciting photojournalism from 10,000 Birds, no? We lined up along the side of the trail as the sun went down, straining our ears for the sound of Black Rails, like in the picture at the top of this post. 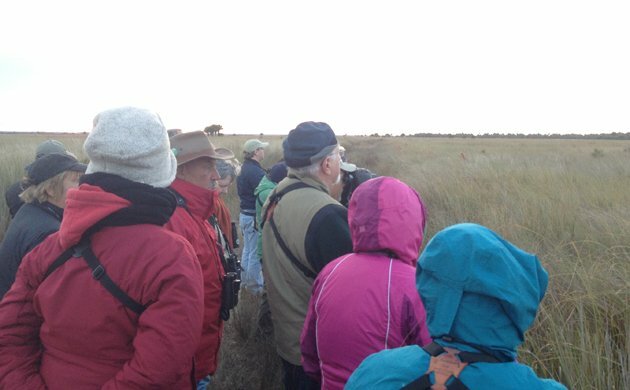 Mike had already explained to us that, in his experience, Black Rails at St. John’s tended to make contact calls very shortly after sunset. And it wasn’t long before we heard just such a call. “Churt,” came from the marsh and, just like that, I had heard a Black Rail. We also heard a second rail call and though we tried our best to lure one in for a look it was not to be. 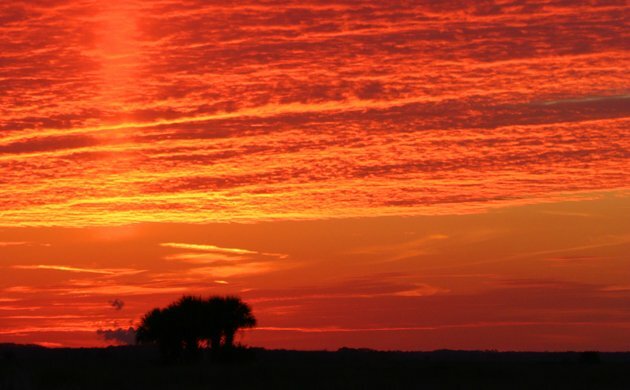 Nonetheless, hearing tiny little rails in the midst of a vast marsh with a score of other birders while an amazing sunset lit up the sky was an awesome experience. The ride back to our parked cars was much more upbeat than it was two years ago. We had heard two Black Rails! Success! We were a happy bunch of birders well satisfied with our experience. Now I just have to figure out how to see one which, word is, is exactly what the group who went out into the marsh with Mike the next night got to experience. Amazing how happy a tape player can make people. Were you out hiding in the marsh again, Jochen? Yeah, I was the one who had caught all the black rails and pressed their bills shut so they wouldn’t be able to call or run towards you and be seen.